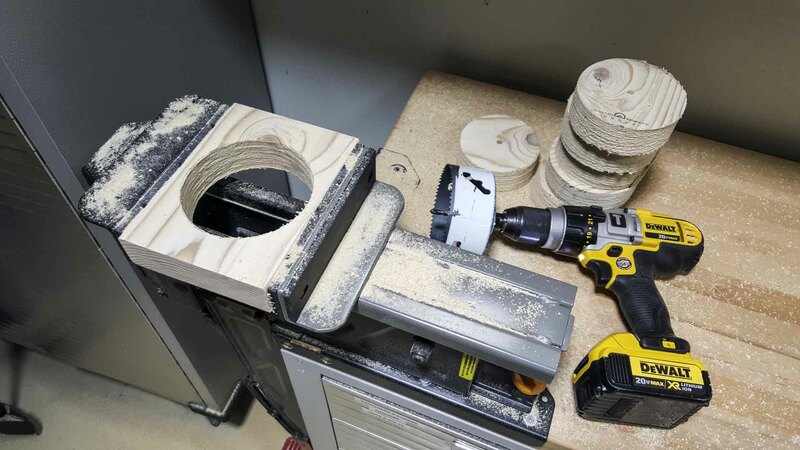 May 30, 2016 by John P.
If you’ve got a shop and you’re thinking about building a dust collector, I’ve assembled a complete list of parts along with a host of tips based on the system I built for my own shop / garage. Both the video and this written tutorial contain additional bits of information, so for a complete idea please review both. Now, lets get started! Building this system required piecing together a large number of parts that took me several weeks to get right. First thing’s first, check out our video overview to see how the entire thing comes together. I started out with a 2″ x 6″ and sliced it into 7 1/4″ sections. This matched the width of a 8″ board I bought to make the actual back. So the trick is to make sure you’re slicing the 2″ x 6″ and the base board to be the same width so they look right when you put them together. I clamped a block of wood into my saw so that I could make extremely repeatable cuts at the exact same length on each piece. I found it was best to then pre-drill the holes for the screws that would be used to hold the two halves together before actually cutting the piece in half. 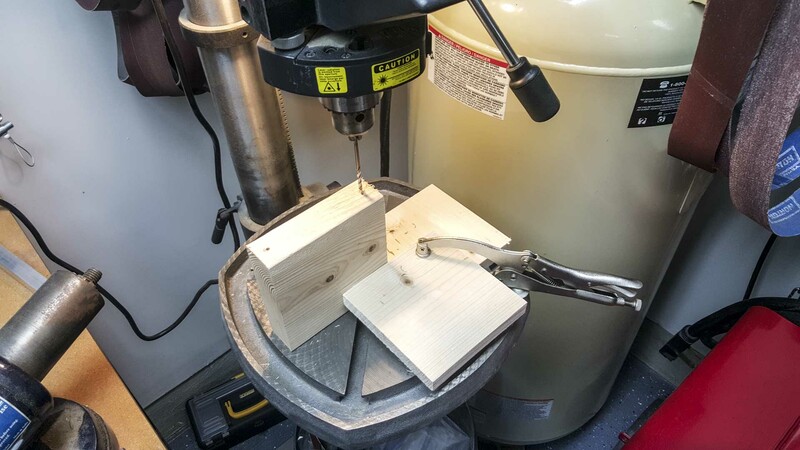 Again, I would highly recommend clamping some blocks in place to make your drill holes repeatable and as close to identical as possible. 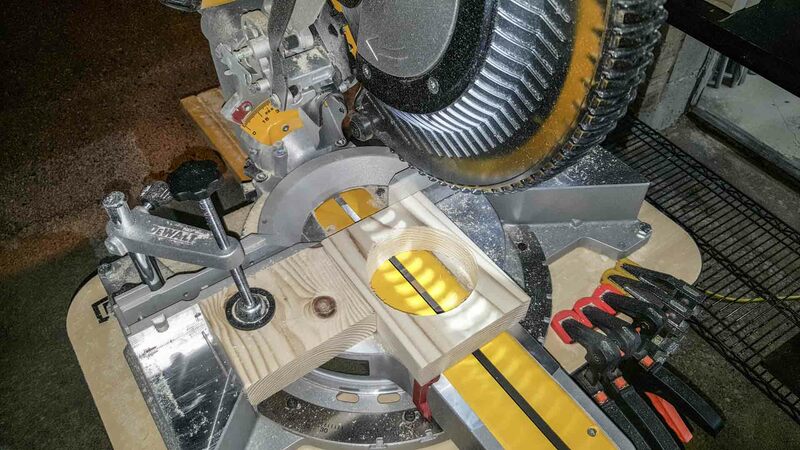 Mount each section in a vice, mark the absolute center, and drill the 4.5″ hole using the hole saw. And since I know none of them are going to be absolutely identical, I numbered both halves so that I could keep the same pieces together to ensure my predrilled holes lined up. 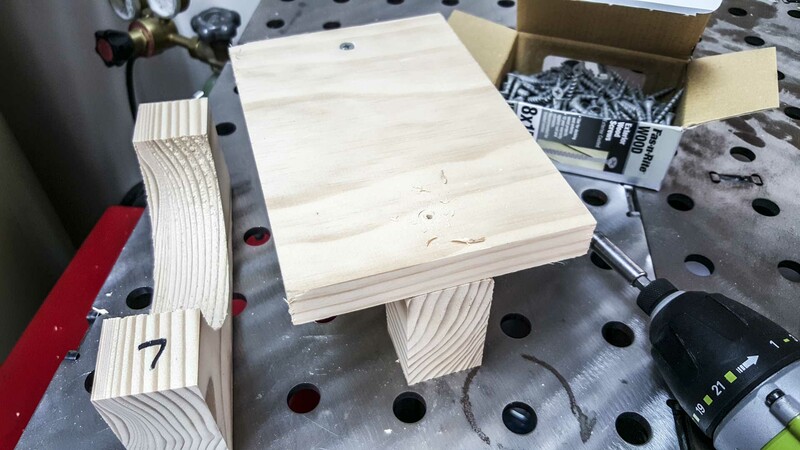 At this point, you grab half of your clamp and screw it to the base, being sure to pre-drill the holes so you don’t split the wood. Just to be clear about all of this pre-drilling… make sure you choose a drill bit that is just slightly smaller than the screw, and pre-drill almost the entire length of the screw you’re using. Here are all of the various parts that I used while assembling this system. You’ll see how each of them are employed in the overview video. As I mentioned, I also used Schedule 40 PVC pipe that you can get at Home Depot, Lowe’s or any home improvement warehouse. 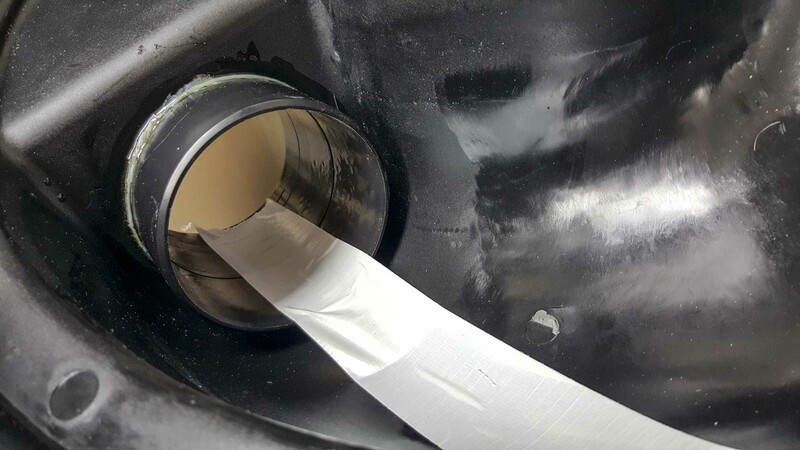 And when connecting a piece of PVC directly to something like the 4″ Splice or a Blast Gate, you’ll need to predrill some small holes and use screws to hold them together. Otherwise, you’ll have to use a more permanent method such as Plastic Weld. To start with, I used the Woodstock W1049 dust separator, but I wish I hadn’t. I required me to also use a couple of other parts to be able to even connect the hoses to it. 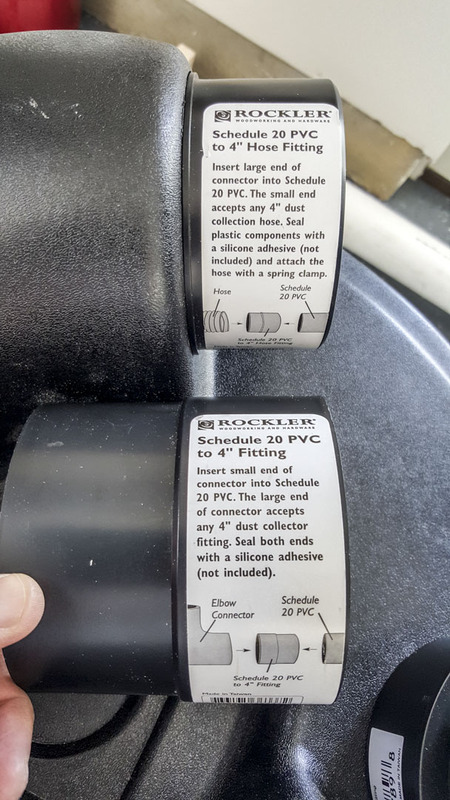 I had to buy these weird Schedule 20 PVC to 4″ Fittings from Rockler, and then I needed to carefully Gorilla Glue them in place. Without them, there is NO WAY to connect your system to it. So it’s about the worst design in the universe. 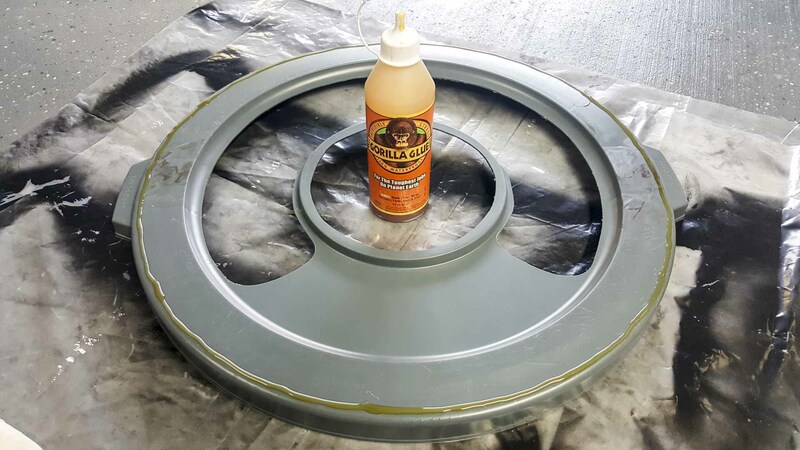 By the way, gluing them in place essentially involved pushing them into the holes and then pouring gorilla glue all over the seam and allowing it to kind of just flow around and coat the whole thing. A piece of Duck Tape held it in place while it hardened. So if you get the exact same top as I did, you’ll need those connectors. Instead, I would recommend the Alternate trash can cyclone lid listed above, and you can substitute it right into the plans. 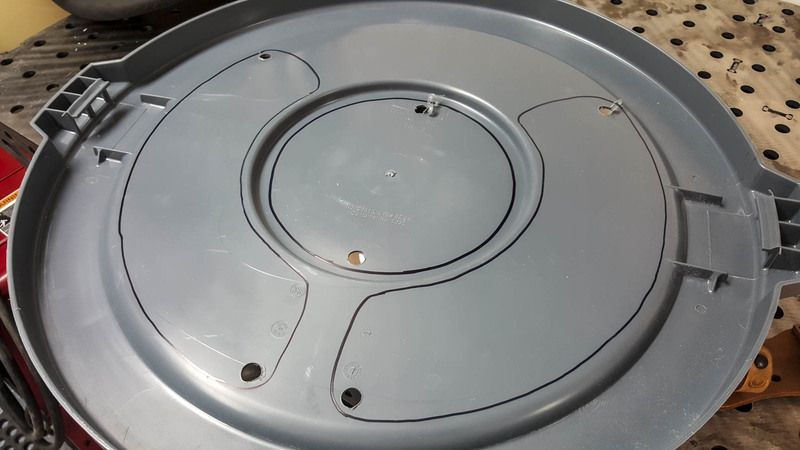 Now, as I mentioned, I used the Rubbermaid trash can, so I simply marked the lid where I wanted to cut part of it out, and then pre-drilled holes large enough to get a jigsaw blade into the material. I then cut the pieces out from the lid, and added rubber weatherstrip around the inside to ensure it makes a good seal when placed on the trash can. 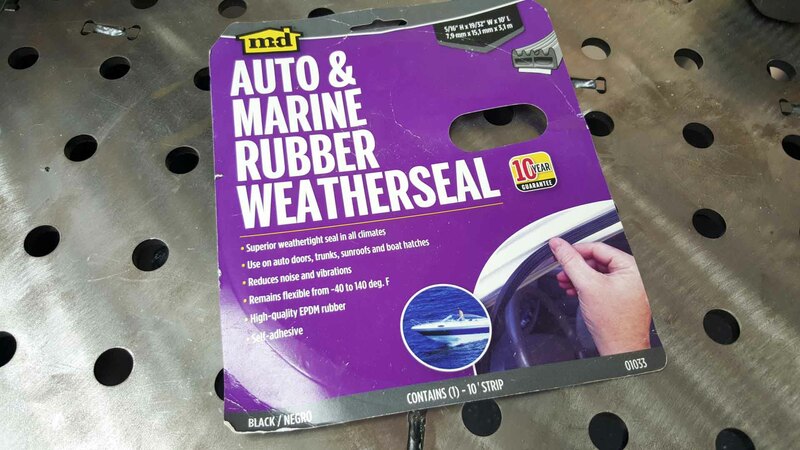 I recommend the Auto / Marine weatherstrip to make the best air-tight seal. 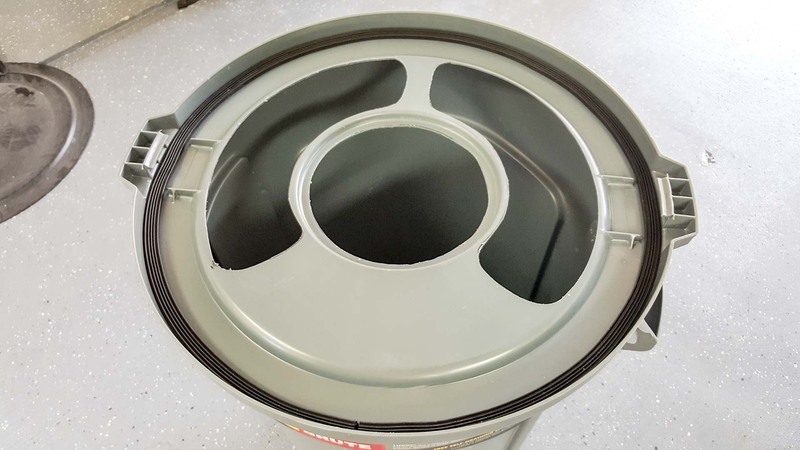 After making the holes, I Gorilla Glued the trash can lid and the dust collector list together. First you make a bead all around the trash can lid, while placing it on a very flat surface with protection underneath. Then press the collector on top and leave it alone for about a day. The process worked – but the glue proved to be far too brittle. So I’ll be removing it and instead using plastic weld, which is what I would recommend going forward. One last thing I would recommend is thinking through how you are going to actually mount things. In my garage there was a 90 degree corner that pretty much sat at the center of everything, so I chose to start by mounting it first, and then working my way out and around from there. 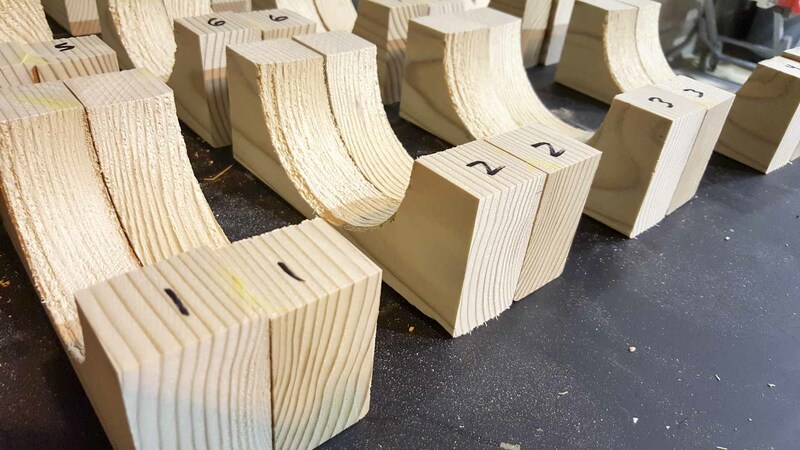 When you cut your PVC sections, hammer them into the junctions with something like a rubber or leather mallet to ensure a nice tight fit, then put them together. And finally, I personally rely on a very specific type of wall anchor that I trust. I hung this entire system with the Toggler Snaptoggle BB 1/4″ Toggle Bolts. WEN 90243-027-2 5-Micron Outer Air Filters, 2-Pack, and the $29 WEN 90243-026-2 1-Micron Inner Air Filters, 2-Pack. If I left anything out, or you have any further questions, feel free to drop them below, or Tweet me @Johnpoz. Good demonstration of the installation of the dust collection system. 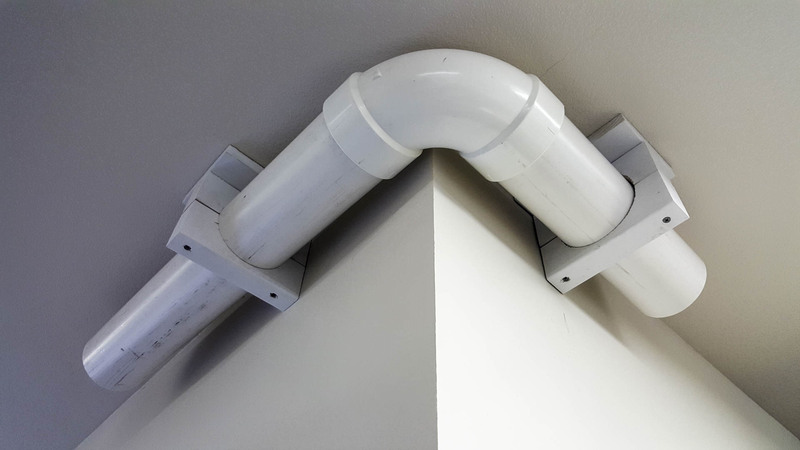 What did you do for grounding your PVC pipes? Hey Tony, its true that static can occur within a system, however its not true that there is a safety issue with it. There has never been a documented fire caused by a dust collector. So if you want to ground the system you could run copper wire outside the pipes to avoid the nusance of getting a little shock occasionally, but its not really necessary. 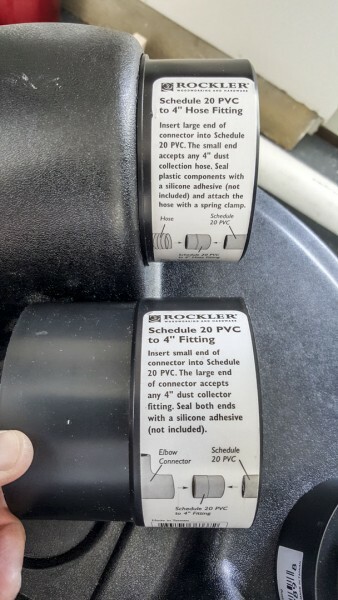 Nice intro to dust collection. Schedule 40 though?, it is only air. The inline cyclone trap is defiantly a big plus. Check out the Instructables web site. They are really easy to make yourself and I’m guessing that that ‘lid’ can be improved upon. Also the second stage room air filter tells me your serious about your health. a) Just use a sheet metal screw to secure your fittings and pipe together. Predrilled of course. b) Nothing is nicer than using current sensing to automatically turn on and off your dust collection system. 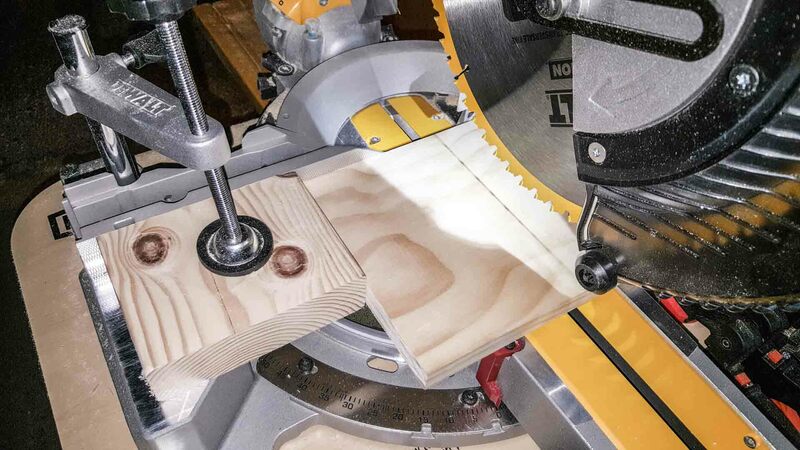 Just turn on your table-saw or router and “woush”. My small shop vac has this feature and it comes in very handy. c) If you haven’t already done so, you may want to check out the Dylos brand of low cost particle counters. They work remarkably well as I can attest. I bought the DC1100 with the finer particle resolution. They don’t miss much. Laminar vs turbulent airflow! Been awhile since I did a calc but indeed a 90 degree turn will kill the flow of air or water. It will also cause the dust to linger in an area of the pipe instead of going to the collection point. Very cool James! I didn’t even know there was a calculation you could really do on this, so thanks for enlightening us. If you could share any more insight it would be fantastic!